Participants will attend a leadership development seminar, gain priority access to an internship with the U.S. Air Force, attend retreats and visit the Civil War battlefields of Gettysburg, Pennsylvania. “Students in the CSS learn the theory, tools and practices to verify the security and integrity of operations formally. This capability is the basis for assuring missions in cyber physical space no matter the application. There is no other program like this in the nation,” says Professor Shiu-Kai Chin. The CSS consists of a core course load, electives and professional development. Core ABET-accredited courses include CIS 400: Certified Security by Design, CSE 484: Introduction to Computer and Network Security, and CIS 487: Access Control, Security, and Trust. Electives are tailored to individual student needs and interests. Professional preparation includes an internship and leadership development. 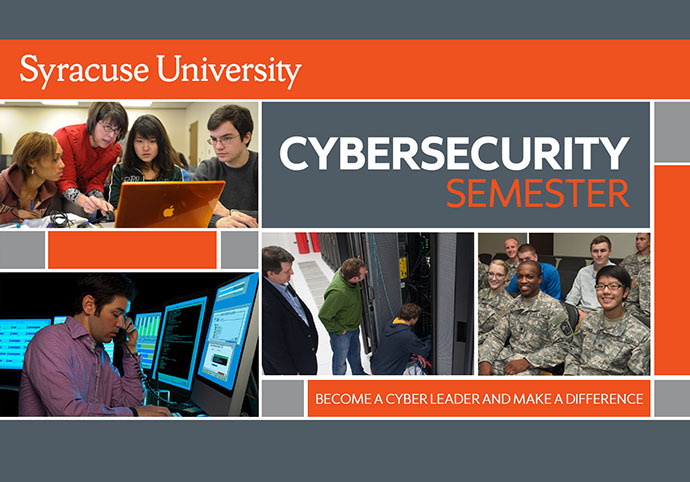 Students must be seniors or juniors in a computer science or computer engineering undergraduate program with an appropriate level of prior coursework and a preferred GPA of 3.3 or higher. They must also have experience with Discrete mathematics, programming experience in a high-level language and familiarity with Linux at the command-line level. It may also require a U.S. citizenship or permanent resident status to be eligible for internship opportunities, an optional part of the program. A letter of recommendation from an academic advisor or faculty member must also be sent to cyberengineering@syr.edu directly from the reference by the deadline. For ROTC cadets, a letter of reference from ROTC detachment leadership is also acceptable. Admission notifications will be sent in April.